I loved reggae. I loved Bob Marley, U-Roy, Peter Tosh... I loved all those guys. 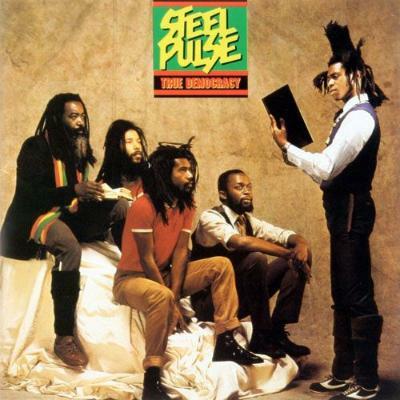 But then, these young cats came out from somewhere, called Steel Pulse. Who the heck are these guys? These guys were based in Birmingham! They were not even based in Jamaica! And then they came out with this album, I was like, woah! And that whole album, that era, 'Worth His Weight In Gold (Rally Round)', 'Leggo Beast' - that album on its own is a classic. Whenever in those days we wanted a break from the Afrobeat and wanted to refresh, I just bring out my Steel Pulse collection and start off with True Democracy. A lot of us who were into Afrobeat big time were big reggae fans, because one thing we found synonymous was the bass. The bass lines. That thumping bass, the consistency. The head bopping. And when I was at that age I always loved to head bop all the time, if it don't bop my head… You know? And that is why I also like bebop. I'm so happy they are back again. They have been on a comeback tour again recently. I have a lot of respect for them. Especially when I realised they are actually based in the UK, in Birmingham. And, man, I loved what they managed to achieve in a very short period of time, they were arty. [sings] "Rally round the flag, Rally round the flag, Rally round the red, gold, black and green." I remember those good old days, man. Chilling with my mates, we were talking about world peace, the world, injustice, love, harmony, all those things, you know? Someone who is idealistic. It's a dream. It may not come true, but you know what? It's just a dream! Dream on! It's hardly going to happen, but most of us, we are not like that. We were always dreamers and if you just dream it, then it can come true. This was a seminal album. 'Chant A Psalm', that particular song, woah! Man! Damn! [sings along] "Get thee behind me, Satan." "Chant a psalm a day" - a psalm of the Bible, just chant one psalm, because, you know, we fight against the principalities that exist and the realms. Very conscious living. When I was living with Fela, he was also talking about returning to natural practices. Fela had a ban on Western medicine. He never took any Panadols, no paracetamols, no painkillers. If he was in pain, he was going to drink water, warm water, water with salt, or cold water. Or he would ask for special water from a rock. You know when you go to where the springs starts from, most of the time it could be from a rocky place. You ask for special water from a rocky place and keep it at home. Because he believed there was a special purity about water that comes from a rock. Badass brothers, man. When I saw the album cover and saw their picture, I was like, man, these guys are like, woo! The whole album for me was a revelation. Because these guys were young then, 1982. Now, look at that album cover. At the age of 16, 17, when you see that, would you not be tripping? Look at that! Man! So, both the album cover, the design and the message contained, you know, speaking about most conscious topics, that a lot of people would normally not really take into consideration. But because of Fela's influences on us we were used to political content, or socially conscious content in music, and this was very, very conscious, on a high level.